Guatemalan rice is a delicious white rice with some added vegetables. It is really easy to make and a wonderful side dish for just about anything. We had it as part of our Guatemalan meal with Pepian de Pollo. Use whatever vegetables you have on hand, any mix will do even frozen. Enjoy! Heat oil in heavy saucepan and add rice. 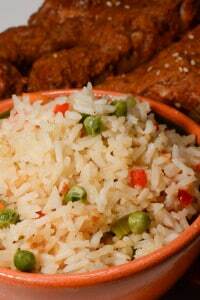 Sauté lightly until rice has absorbed the oil, being careful not to let it color. Add mixed vegetables, salt, pepper, and chicken stock. Cook for about 20 minutes until rice is tender and the liquid has been absorbed.